Magic Leap - the augmented reality company that received $542 million from a group of investors led by Google last year - has revealed another video (below) showing off some of the amazing technology that money helped fund. The new clip was demoed at the Wall Street Journal’s WSJD live event in Laguna Beach, California, yesterday. In the video, which was shot directly through Magic Leap technology and without any special effects or compositing, we see a drone hovering beneath a desk and our whole solar system floating in an office. Both the objects in the video appear to maintain their positioning no matter how much the user moves their head. 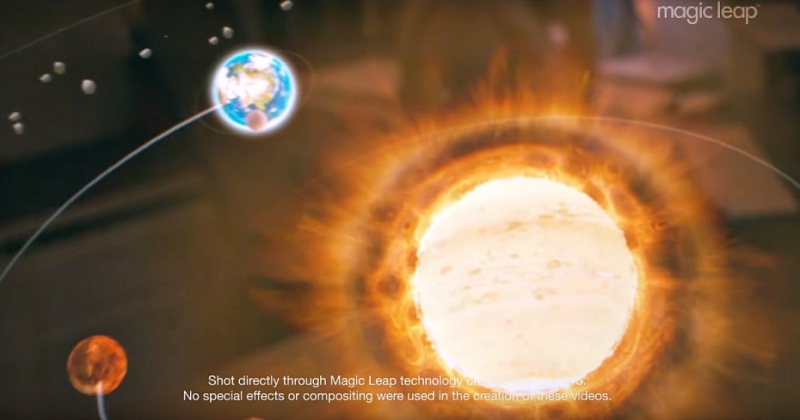 Magic Leap released a video back in March titled “Just another day in the office at Magic Leap,” but it was full of added special effects and more of a concept video. During the WSJD event, Magic Leap CEO and founder Rony Abvitz – who describes the company’s technology as “cinematic reality” – said the AR hardware is a self-contained computer that’s small and light enough to wear comfortably while walking about. Abvitz added that the hardware’s design is such that users won’t mind wearing it out in public, according to Engadget. When comparing Magic Leap’s augmented reality technology with virtual reality, which has been known to cause nausea, Abvitz said: "We believe the future of computing should be natural […] With Magic Leap, your brain doesn't distinguish what's real and what's Magic Leap. Because as far as your brain's concerned, it is real." We still don’t know exactly what the device will look like or when it may go on sale, although Abovitz did say the company is moving into a former Motorola factory in Florida and is gearing up to ship “millions” of units. Google isn’t the only company investing in AR technology; with Microsoft betting big on its Hololens program, and news that Asus is discussing the possibility of building its own version of the device, it appears there are some big names in the tech industry who believe augmented reality is set to become very popular with consumers over the next few years.